getcalc.com's triangle area calculator is an online basic geometry tool to calculate the area of a triangle shape, in both US customary & metric (SI) units. The step by step workout for how to find what is the area of a triangle. Students may use this triangle area calculator to generate work with steps for any other similar input values. Triangleis a two dimensional plane or geometric shape with three straight sides and three angles. In other words, it's a polygon with three edges and three vertices. The sum of three angles in a triangle is always equal to 180 degrees (180º). There are different types of triangle such as Equilateral, Isosceles, Scalene, Acute, Obtuse and Right Angle Triangle. A triangle with three equal length of sides called an equilateral triangle, whereas an isosceles consists of two sides of equal length. 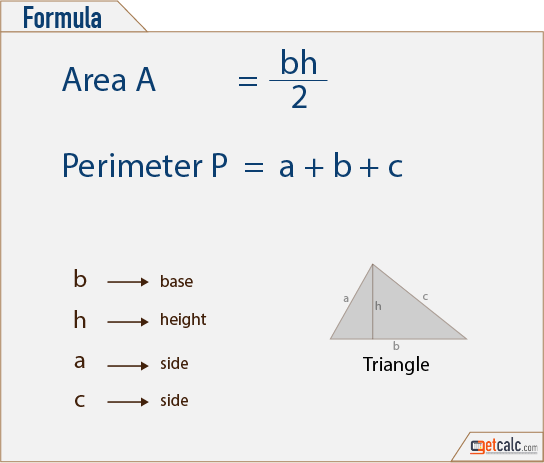 K-12 students may refer the below formulas of triangle to know what are all the input parameters are being used to find the area of triangle. Find what is the area of triangle whose base is 25 inches and height is 14 inches? The base & height of the triangle measured as 72 inches & 65 inches respectively, find what is the area of triangle?